RUBIROSA uses exclusively European leather for the manufacture of its shoes and bags, which is partly vegetable tanned in Italy and Germany. Leather is a fascinating product and has accompanied, protected and kept mankind warm from the outset. Despite the thick, almost waterproof skin, it is breathable. This means that it allows sufficient moisture and air through and absorbs grease like human skin. As leather is perishable however, man quickly started developing methods to stabilise the raw animal hide and thereby make it more durable. This process is known as tanning. The leather types used by RUBIROSA are vegetable tanned or chrome tanned. Each of these tanning methods gives the leather specific characteristics, which are significant for its later application. Chrome tanning creates a soft, light and pliable leather and is therefore used as upper leather. Vegetable tanning is used for interior leather. As it is purely plant-based and the interior leather might later come into direct contact with the skin, allergic reactions are ruled out with this tanning process. Nappa leather is a smooth, supple leather, which originates from the upper layer of the skin (grain side). Calf nappa generally feels strong in the hand and is very durable. It can be recognised by the small hair pores which break up the relatively smooth surface. A calf has the same number of hairs and hair pores as a fully-grown cow, but with the difference that these are distributed over a smaller surface area. This gives calf leather a more even look, is smoother and finer and, in comparison to cowhide, has the same or even greater resistance to tearing. For velour leather, the flesh side of the skin is honed, giving the leather a velvety surface and slight pile. The fibres are less dense than and not as finely intertwined as smooth leather, making velour leather less firm and robust in its natural state. It develops a remarkable resistance to tearing through the tanning process however. Horse leather is very rare nowadays and demand greatly exceeds supply. The leather is particularly durable. It is rich in fat and is therefore water-repellent. 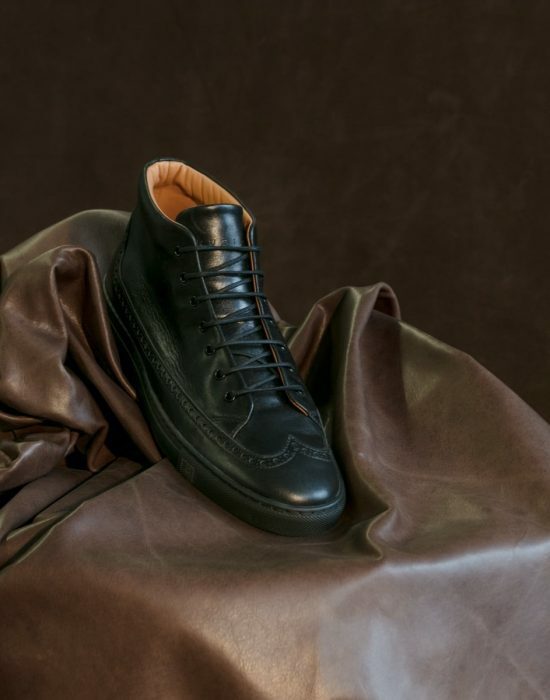 The horse leather used by RUBIROSA originates from animals from Switzerland and southern Germany and is produced using the particularly gentle olive leaf tanning process, whereby the use of sulphuric acid and salt is completely forgone. The tanning agent, oleuropeine, is so pure that it is also found in extra virgin olive oil. All incidental residual substances are 100% recyclable or can be used further. The wastewater from tanning is cleaned in a purely ecological treatment plant. Traditional lacquers are not used to finish this leather. To favour the natural features of BLATTWERK leather, even the use of dyes is entirely ruled out. After colouring, genuine beeswax is used to protect the BLATTWERK leather from environmental factors. Cowhide leather generally feels strong in the hand and is very robust and is therefore extremely versatile. It can be recognised by the small hair pores which break up the relatively smooth surface. Vegetable tanning is a purely plant-based and natural method of processing animal hides. The raw animal hides are tanned in this way to stabilise them and allow the resulting leather to be processed further. The actual tanning process takes multiple months. The factors of durability, versatile and unique processing options and quality aspects are pivotal for vegetable tanned leather.